We are knee deep in lists, old clothes and rogue meals made from what's left in our freezer (so, you know, typical moving problems) so today's Can't Live Without It will be short and sweet. 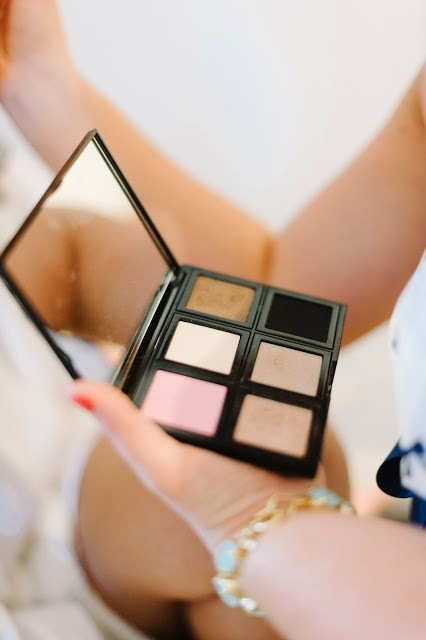 I can't live without my palette from Bobbi Brown. I created the original combo for my wedding day (hence the glam pic) but have refilled each item as soon as it's run out ever since. The eye shadows are the perfect set for a simple day look but can be layered and mixed to created the most gorgeous and dramatic smokey eye. I use the dark black with this brush as eyeliner and the soft pink blush creates the sweetest glow, especially at the end of this heinous winter weather when I don't have a glow of my own. If you're interested in the story of how I ended up doing my own make up on my wedding day despite having an "artist" booked for months, then here 'ya go! I hope ya'll have a fab weekend! I want every single color on that pallet! I can't believe you had to do your own makeup on the day of! You looked hot (and got to learn all those tips and tricks) so I guess it worked out in the end!